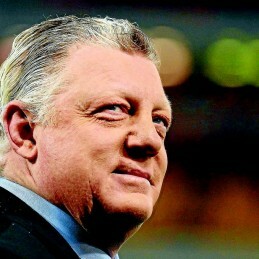 Phil Gould is a rugby league great who has starred as a player, commentator, coach and administrator. He is currently the Executive General Manager of rugby league for Penrith, a commentator for Channel Nine and a writer for Fairfax Media. Following his 10-year playing career, Phil would coach at club level before becoming New South Wales’ most successful State of Origin coach. Phil has been a regular contributor to a range of community and charity organisations, including: Panthers on the Prowl, Panthers Women in League, Randwick Children’s Hospital, Brave Hearts Foundation, St Gabriel’s School for Hearing Impaired Children, Trees of Hope Foundation, the McGrath Foundation, and the White Ribbon Foundation. Phil has worked to develop rugby league in Papua New Guinea, working with their government to develop a variety of programs. A playing career that would span ten years, Phil made his start with the Penrith Panthers in 1976 and in his third year, at just 20 years of age, he would become the club’s youngest captain. He would then play two seasons with the Newtown Jets, then three with Cantebury, finishing with South Sydney in 1986. Following his retirement, he began coaching Cantebury in 1988. He then led Penrith to their first Grand Final in 1990 and their inaugural premiership in 1991. He coached New South Wales in eight State of Origin series over two separate stints. Between 2002 and 2004 he held the title of Director of Coaching with the Sydney Roosters before returning to the Panthers in 2011 as the Executive General Manager of Rugby League. In 2014 Phil was awarded a Member in the general division (AM) for ‘significant service to rugby league as an administrator, commentator, coach and player, and to the community.’ A popular motivational speaker, Phil speaks to a range of audiences including health, business and sporting sectors.